CruelLEGACEY is here to help you sharpen up your online multiplayer skills. Welcome to episode 1 of CruelLEGACEY’s Halo Multiplayer Tips and Tricks! This all new video guide illustrates some of my favorite moves to use in the online battlefield. From general strategies to advanced manuevers, this series will help you sharpen your multiplayer skills. 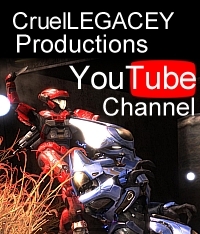 Stay tuned for more installments of CruelLEGACEY’s Halo Multiplayer Tips and Tricks! This entry was posted in halo reach, Strategy Guides, Video. Bookmark the permalink.